This pâté-style loaf provides complete, balanced nutrition and a source of moisture that can be beneficial to small dogs. Gram-for-gram, wet foods like the CESAR® brand have fewer calories than dry food. Mixed with CESAR® Dry food, it makes a perfect meal for small dogs. Now you can add more diversity to your small dog's meals by picking up our convenient variety 12-pack! 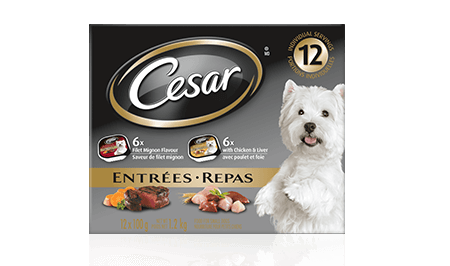 CESAR® ENTRÉES: 6 FILET MIGNON FLAVOUR & 6 WITH CHICKEN AND LIVER 12x100g is rated 4.5 out of 5 by 70. Rated 4 out of 5 by LYNDARON_363835332 from I really like the convenient serving size portions. I don't regularly serve wet food to my dog, so it is much better not having leftovers when I do. My dog loves both the Filet Mignon and the Chicken with Liver flavours! Another bonus worth noting is the smell when you open it. I often find the smell of wet food very unpleasant and have to be careful to wash the container thoroughly before disposal. I was surprised when I opened these, the smell is minimal and actually not bad at all! Overall, I was very impressed with this product and will be buying more. Rated 5 out of 5 by KARENONS_363830692 from My dog went nuts for Cesar soft dog food. I do not feel my dog should eat a strictly soft food diet so I mix the Cesar food in with his regular kibble food. My dog does not always eat his required serving amount of food a day regardless of the kibble I have tried for him over the years however he always eats when I mix in the Cesar dog food so it will now be a staple in our house to ensure he eats regularly. Rated 3 out of 5 by VALERIEHBC_363830611 from Arrived promptly, thank you! Appears to be good consistency......however with the 1st ingredient listed as :meat by-products ??? ummm In comparing it to other brands that state: NO by-products....this is troublesome for me. Would prefer whole grains, veges., fruits, minerals and such....with NO by-products... Think this company should re-work their formulas to eliminate this! Rated 5 out of 5 by SARAHWPE_363829136 from My dog, Tails, loved both flavours but seems to have a special love for the Filet Mignon one. I used half of the dish as a topper for his dry food at supper time and he loves it so much I even let him lick the spoon. It smells good and doesn't give him the rank fishy breath that some foods do. It's also a good consistency to stuff into a kong and freeze for a distracting treat. Rated 5 out of 5 by SANDYLON_363807653 from Although the price for this product is a little high, I will definitely be buying more! My little Shih Tsu loved this product. However, my Havenese didn't care for it at all. Still every dog has different tastes. Some are fussier than others. So I will be buying this product for my Shih Tsu as he devoured it like no tomorrow! Rated 5 out of 5 by CHERYLDNS_363825616 from My dog loved this food. She usually leaves her food untouched and goes back for it when she gets hungry. With this food, she was jumping up on us trying to get it as soon as we'd peel the foil back. She started getting very excited and barking when she realised it was supper time. We'll definitely be buying more for her. Rated 4 out of 5 by RANDYLON_363841795 from My step mothers dog is usually very picky when eating and has to be sat with to eat his dinner. We usually use food enhancers for him to eat his regular food so this was the perfect product to try with him. He took to it right away and didn't have any issues. So we will probably start using this product from now on. CESAR® Entrées Filet Mignon Flavour Food For Small Dogs is formulated to meet the nutritional levels established by the AAFCO Dog Food Nutrient Profiles for maintenance. CESAR® Entrées With Chicken & Liver Food For Small Dogs is formulated to meet the nutritional levels established by the AAFCO Dog Food Nutrient Profiles for maintenance. Filet Mignon:MEAT BY-PRODUCTS, LIVER, BEEF, CHICKEN, CHICKEN BY-PRODUCTS, MINERALS AND VITAMINS, COLOUR, GUMS, DRIED YAM, NATURAL FLAVOURS, FILET MIGNON FLAVOUR, SODIUM NITRITE (FOR COLOUR RETENTION), WATER SUFFICIENT FOR PROCESSING.Chicken and liver:MEAT BY-PRODUCTS, CHICKEN BY-PRODUCTS, CHICKEN, LIVER, MINERALS AND VITAMINS, GUMS, DRIED YAM, NATURAL FLAVOURS, COLOURS, SODIUM NITRITE (FOR COLOUR RETENTION), WATER SUFFICIENT FOR PROCESSING.